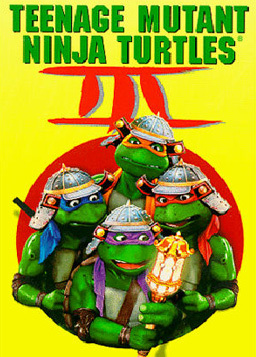 There once was a time when the Teenage Mutant Ninja Turtles seemed like the greatest thing ever. Unfortunately, the bubble burst pretty quickly due to cash-grabbing marketing schemes. With corporate giants attacking the franchise from all sides, continuity was completely broken in the TMNT universe. For many fans, this would break interest in TMNT and send them running to the next big fad. Here are seven Teenage Mutant Ninja Turtles marketing disasters. And the award for “most forced cameo of the year” goes to… Vanilla Ice! The music industry chewed up Vanilla Ice for breakfast and spit him out for dinner. Never failing to force a tie-in, the Ice man himself appears in the second TMNT movie. What probably seemed like a good idea during production of the movie was already an irrelevant cameo by the film’s release. 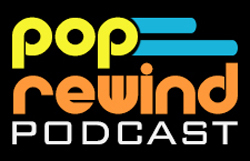 Considering the song “Ninja Rap” was film-specific, it’s hard to imagine it held any interest to radio DJs and the fan of Vanilla Ice. Somehow, sewer lids just don’t seem as threatening as ninja weapons. It was an easy gimmick: sign on the Turtles for an exclusive deal at a Disney park and kids would beg parents more than ever to re-think the family vacation. It worked. Teenagers in turtle costumes roamed the theme park, slapping kids high-fives along the way. Several times a day, the turtle crew would do a live stage number that involved some epic TMNT lip-syncing moves. In truth, it was a pretty boring show. Even the movie poster doesn’t feel like it had a budget. By the time the third movie came out, most fans had abandoned the turtles. This movie picked up where the second film left off, leaving Shredder out of the movie. Instead, it focused on his sidekick henchman’s ancestor. Oh, I guess I forgot to mention the turtles travel back in time after holding a magic lantern. Even ignoring cheesy production effects, this movie was a dud. I’m sure this won over some new fans… NOT!!! 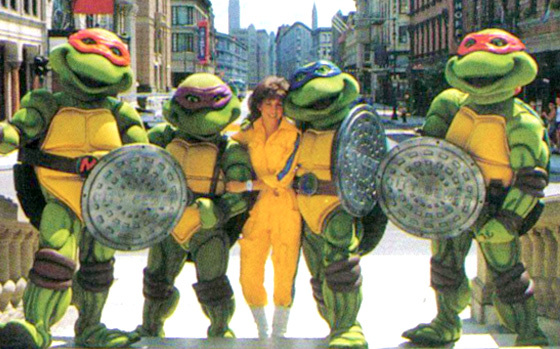 A live-action TMNT TV show probably seemed like a good idea at the time. After all, the movies were wildly popular and the cartoon series made someone a lot of money. Unfortunately, Ninja Turtles: The Next Mutation was a total disaster. April was suspiciously absent from this series and female turtle Venus de Milo joined the group. Peter Laird, co-creator of TMNT, completely despises Venus de Milo since day one and likes to pretend she never existed. If only it were that easy for fans. Collect all four (before we re-package them as something else)!!! Wow, that commercial explained nothing. Two decades later and I’m still not sure what the deal was with the “Coming Out of Their Shells” campaign. It was a live stage show in which the turtles played air guitar and fans got a chance to boo Shredder. Perhaps in the era where every popular fad was “on ice” this seemed like a good alternative, but it never really caught on. A cassette of the soundtrack was available at Pizza Hut. Why? Because you can’t buy pizza at record stores, dude. Next time, leave the parodies to Weird Al. Picking the number one spot for this list was a difficult decision, but Turtle Tunes definitely earns it. The premise is that the crew has their own music TV show and they need to produce music videos to fill the time slot. The reality is that viewers had to suffer through TMNT-themed parodies of “Yankee Doodle” and “I’ve Been Working on the Railroad”. Not very original, not very entertaining. Did we miss some of your favorite TMNT Marketing Disasters? Tell us about it in the comments below! The live action series is astonishingly bad. And I don’t wanna brag or anything, but I have Michelangelo’s autograph. Met him at MGM. It’s kind of a big deal. Okay I am mostly with you on these with two exceptions. One is the MGM live turtles show. As a 6 year old at the time this was the GREATEST thing I had ever witnessed and I got all of their autographs! As an older kid I am sure it was crazy lame (and worse as an adult) but for kids it was incredible. Two, the ridiculous TMNT toys released. Now I have to admit when they originally came out I hated most of the random turtle variations. As an adult I have come to love the absurdity of them. Great list overall! The TMNT serve as a warning of what over-marketing something can lead to.